NEW YORK (AP) - Jen Rhines wants to be the top American female finisher at the New York City Marathon, despite taking a five-year break from the event. The three-time Olympian has focused on various races, competing in the 10,000 meters in 2000, the marathon in 2004 and 5,000 meters in 2008. She's returning to the 26.2-mile race on Sunday after picking up her long-distance training in the mountains near her home in Mammoth Lakes, Calif.
Rhines won't be competing against Americans Kara Goucher or Shalane Flanagan, who are focused on U.S. marathon qualifying for the Olympics in January in Houston. Goucher finished third in the 2008 NYC Marathon and Flanagan was second last year in their debuts. 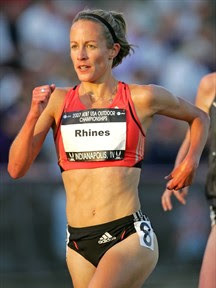 Rhines' previous marathon was a fourth-place finish in Rome in 2006. In August, Rhines finished ninth in 10,000 meters at the world championships in South Korea. She trailed winner Vivian Cheruiyot of Kenya and Flanagan (seventh), but finished ahead of Goucher (13th). This year, she's had victories in the U.S. 15K Championships and U.S. Half-Marathon Championships, finishing in a personal-best 1:11.14. Rhines, who is trained by her husband Terrence Mahon, says she's looking forward to her two favorite parts of the New York race - First Avenue and coming into Central Park. "You use the energy of the crowd, but have to maintain control because it's too early in the race (on First Avenue),'' she said.